Burbank, CA – Every June, kids from all over America face the same dilemma; what to do on Father's Day? A trip to the local amusement park is always fun but he might be too old for the coasters. Going to see the latest film is a great idea but doing it every year becomes routine. The baseball game, the dinner out, etc., all these are fantastic ways to say “thank you dad,” but there is an alternative that is cheap, fun for the whole family and something he will never forget. Take him to the one, the only, the Martial Arts History Museum in Burbank, CA. Dad's love action films and especially, kung fu movies. That “hi-yah” every few moments, that slicing and dicing with the Samurai sword, that battle of the ultimate warrior is something dad's really enjoy and that's what they will get at the Martial Arts Museum. Recognized as the first museum of its kind in the world, the Martial Arts History Museum will not disappoint. Located in the heart of the San Fernando Valley, next to all the movie studios in Burbank, the museum takes visitors on a wild ride in martial arts history. From swords to shark-teeth weapons to the history of anime to the display of the Gopher Chucks from Kung Pow Movie, the Flying Guillotine, the headband from the Karate Kid and more, dad's will be thrilled all day. The museum is very affordable, only $10 per person and takes about an hour to see all the artifacts and access all the information on the walls. “The museum is an excellent alternative for Father's Day. It's a museum so the whole family gets to enjoy it, it's something different and most dads have never even heard of the museum. It's a chance to do something that he will really enjoy,” says museum president Michael Matsuda. “Father's Day is a wonderful time at the museum. Many of the kids and especially the daughters blindfold their day and take him right to the door and remove the blindfold. The dad's are completely shocked there is actually a museum for the martial arts,” adds Matsuda. Designed by the artists of Disney, Dreamworks and The Simpsons, it's a very creative place and its artifacts are laid out in a professional yet fun style. 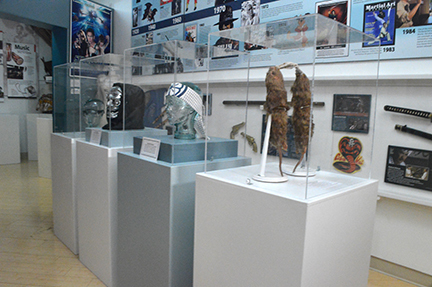 The museum is open from Thursday thru Sunday, 11 am to 6 pm and is located at 2319 W. Magnolia Blvd., Burbank, CA 91506. Website is Mamuseum.com. The Museum is a non-profit 501(c)(3) organization so donations are appreciated.